Bad enough Elijah Colter’s life of comfort comes to an abrupt end when he’s seventeen and his family discovers he’s gay. Bad enough he must live out of his car and turn tricks. But when his perfect boyfriend, Alonzo, becomes the victim of a drive-by shooting, Elijah plummets into suicidal depression. The concepts of trust and hope become more alien to him than ever. All that keeps Elijah going is a promise he made: that he would look after Alonzo’s stepdad, Dizzy, who’s on the verge of losing his house. Diz and Elijah become companions in homelessness—until Elijah discovers a program for throwaway LGBT youth. Through it he secures an apartment… then loses it after a year. He’s kept his promise, though, and until he can get back on his feet, he’s resigned to joining Dizzy in the abandoned factory the older man calls home. One fall day, a pair of new presences in Elijah’s life promise to shape his future: Michael, an outreach volunteer, and Alonzo’s ghost. Both prompt Elijah to decide which of his dreams to pursue, which to cast aside, and just how much he can dare to believe in love, and in himself, again. Despair is life with the love sucked out of it. Love is our greatest renewable resource. Whenever I pick up a K.Z. Snow’s story, I don’t even care about the synopsis anymore. With K.Z. Snow, I know that I will be offered more than just a story but also the artistry of storytelling that makes her one of the few authors who, for me, is in a class of her own. She has tackled important topics before, with a high respect to the issue and sensitivity that leaves no place for formulaic plots. But of course, it also often leaves me with a dilemma of my own. How can I write a review that will do ANY of her books a justice? Especially when I become unable to form coherent opinion — except for sighing, “Gosh I LOVED this” — about it. I’ll give it a try, but forgive me if it doesn’t even come close to what I intended. 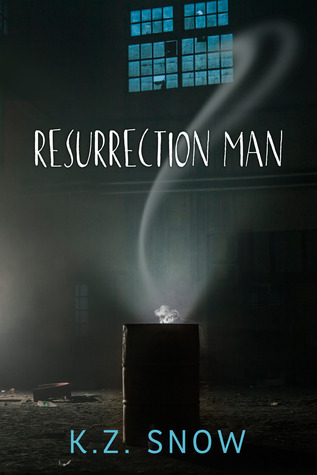 Resurrection Man is a story of a young man, Elijah Colter, twenty years old, blond hair, fair skin and more than the average male’s ration of cuteness who finds the strength within to arise from realities and specter of his past and reach for a better version of himself. For the past two years, Elijah has been living with a hole in his soul, right after his boyfriend Alonzo Morales-Barry is shot in a drive-by. Elijah is only able to live his day-to-day life because he has promised Alonzo that he will take care of Alonzo’s stepfather, Dizzy. Elijah reaches out to a program that helps LGBT homeless youth so he can find a way to support Dizzy. But Elijah’s never feels like he’s complete without his Alonzo. SO WHAT form does the haint of a ruined life take? Maybe this form, blotchy-ink and smeared-pencil scrawls on mismatched pieces of paper. But they’re better than nothing. They’re better than the hole in my soul, and better than oblivion. Now, after having difficulty keeping a job, Elijah is on the brink of losing the apartment that is part of the program, and becoming homeless as well. Enter Michael Hanlan, an outreach volunteer with the Milwaukee Coalition for the Homeless. Michael meets Elijah and Dizzy when he visits the factory where Dizzy is currently staying (and where Elijah is in prospect of staying). Michael is caring and kind … and he sees the full potential within Elijah. He knows that Elijah has the right experience and compassion that other homeless people, especially LGBT youth need. This is where K.Z. Snow’s magic works. Instead of making Michael the gallant white knight in shining armor, Ms. Snow makes Elijah take charge of his own life — through a retrospective view coming from a ‘ghost’ of his past and the realities of his present. Through his resurrection man, Elijah can now evaluate what Alonzo meant to him, what Dizzy means to him, what Michael means to him, and what HIMSELF, Elijah Colter, means to all these people around him. The people in his life and the people who might be part of his life and the people he will reach out to. And what is wonderful about it is that Ms. Snow still gives Elijah room to grow, to stand on his own two feet and become an equal partner for Michael. She doesn’t end this story like a beautiful Christmas present-box with a neat bow on it. She ends it more like a small Christmas tree that is ready to reach its fullest height. If I had a small niggle that stopped me from giving this 5-stars was that the part with Alonzo’s true character felt slightly too black-and-white in the end. I guess I wanted it more to be shades of grey, to make it a more complex situation. Again, this review might not do the book a justice. Some of my words might not even make any sense. I wish I could say a lot more, write a poetic review, full with thoughtful insights that could help readers to know what the book meant for me. But in the end, I could only say that this book was a beauty and joy to read. Yes, it’s that simple. This entry was posted on August 14, 2014 by Ami in Contemporary, Reviewer: Ami and tagged 4.5 Stars, dreamspinner, k.z. snow.